Over the past few weeks, I’ve shown snippets of our fall home in various rooms as I got them all decorated. 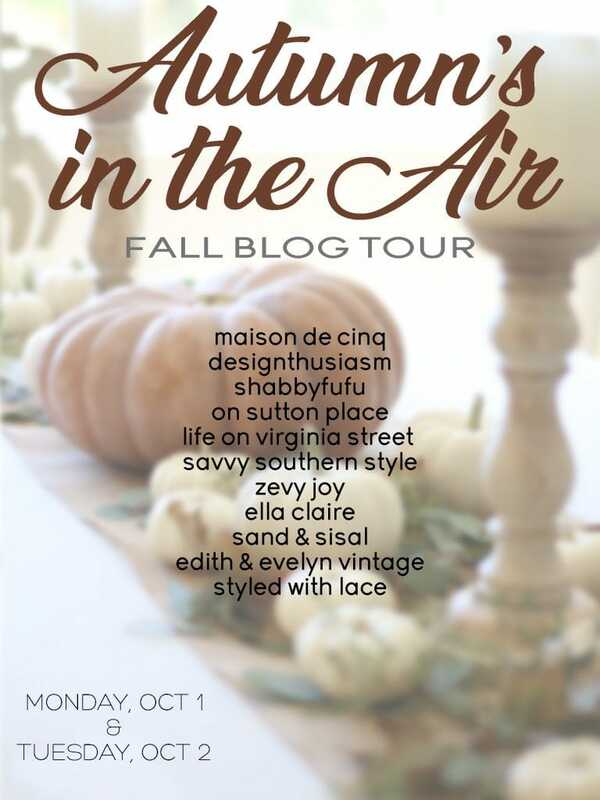 Today I’m back, joining some talented bloggers hosted by my friend Sheila from Maison de Cinq, to share our full fall home tour! I figured it would be easier to have the full tour in one central location for reference, and I’ve added in a few new pics for those of you that have followed along all the various tours! I’ve also added “Get The Look” carousels after each room in our home so you can get the sources or similar looks for each space! If you’re stopping in from Edith & Evelyn Vintage, welcome! 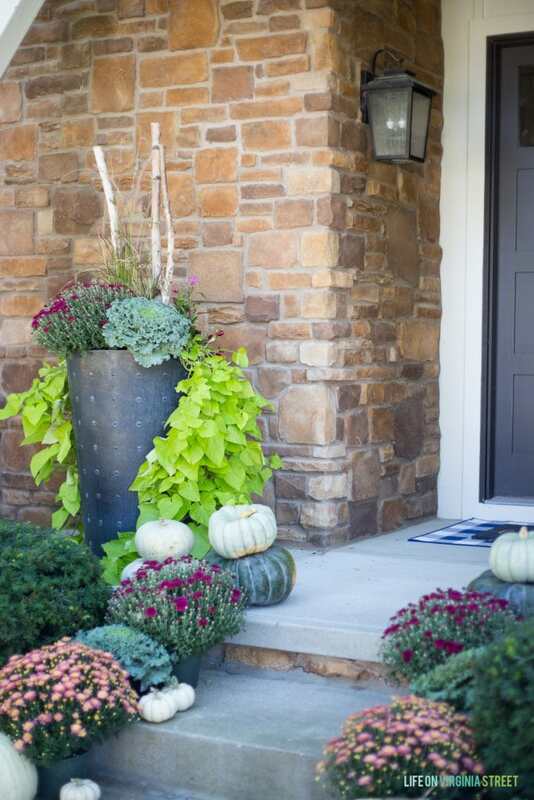 At the end of the post, you’ll find tons more fall inspiration and I hope you look around at each of the stops! 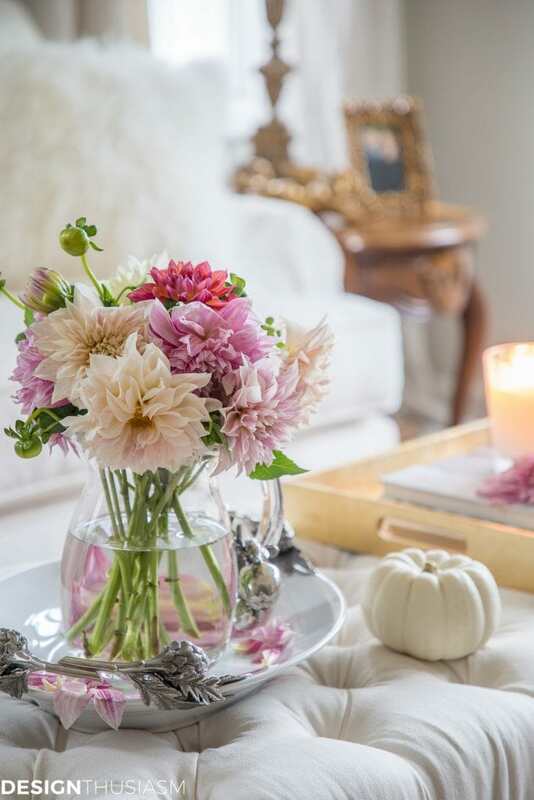 Now that October is here, I feel like I can officially welcome you to our home all dressed up for fall! 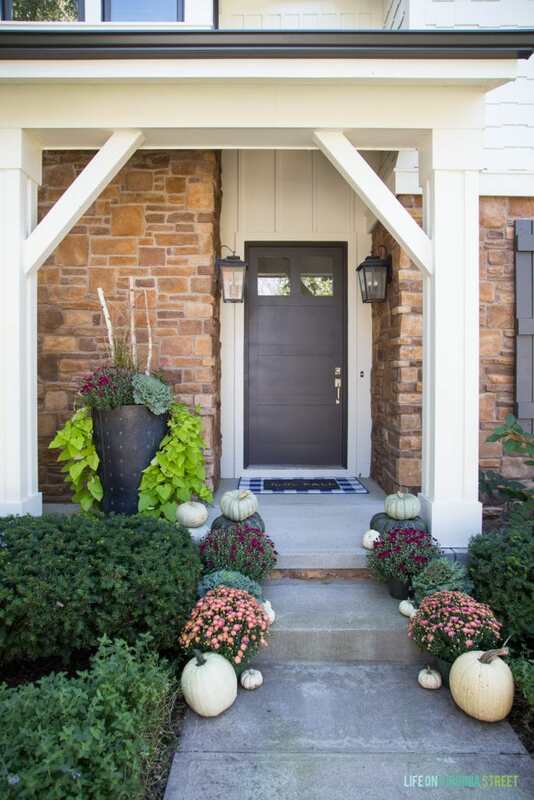 I recently revealed our fall front porch and as you can see below, used some non-traditional colors. Our mums are so close to fully blooming and I can’t wait to see how they look! 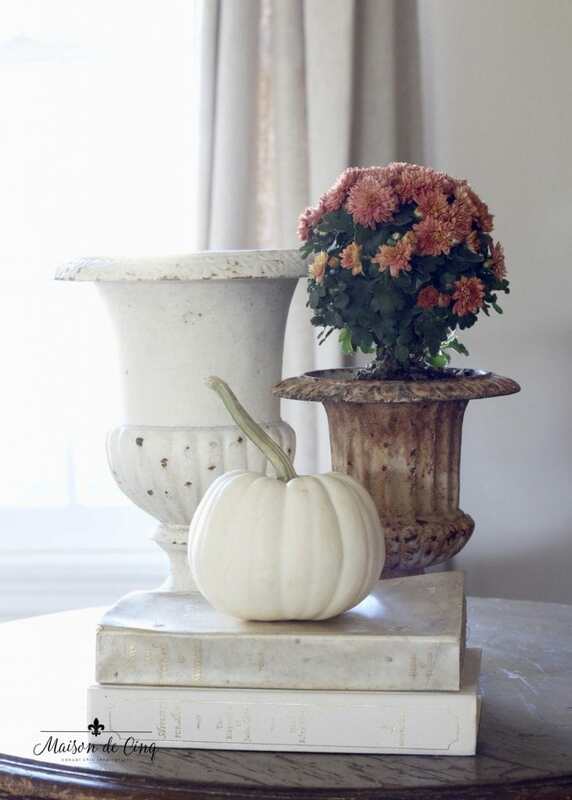 I kept most of our home fairly simple for fall. 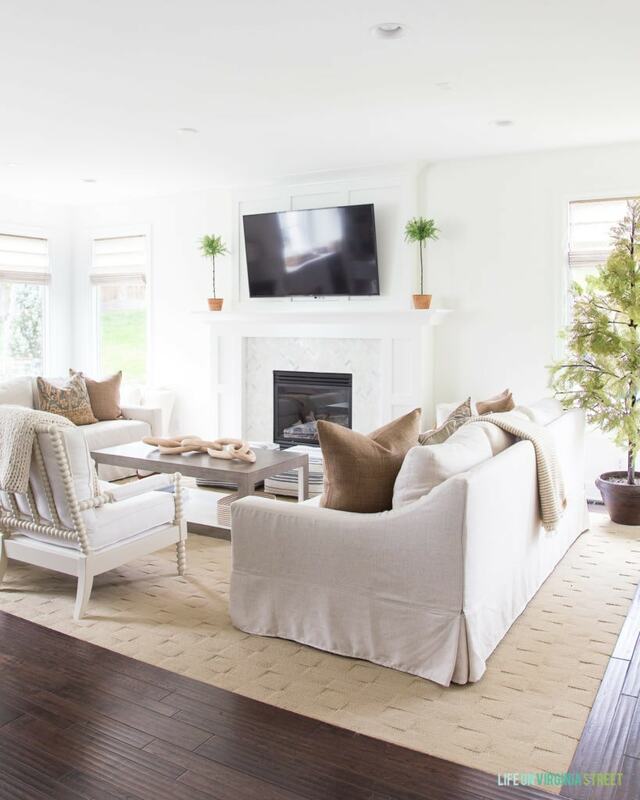 Just a few warmer tones and some faux olive stems and our recently updated kitchen and living room were ready for the new season! 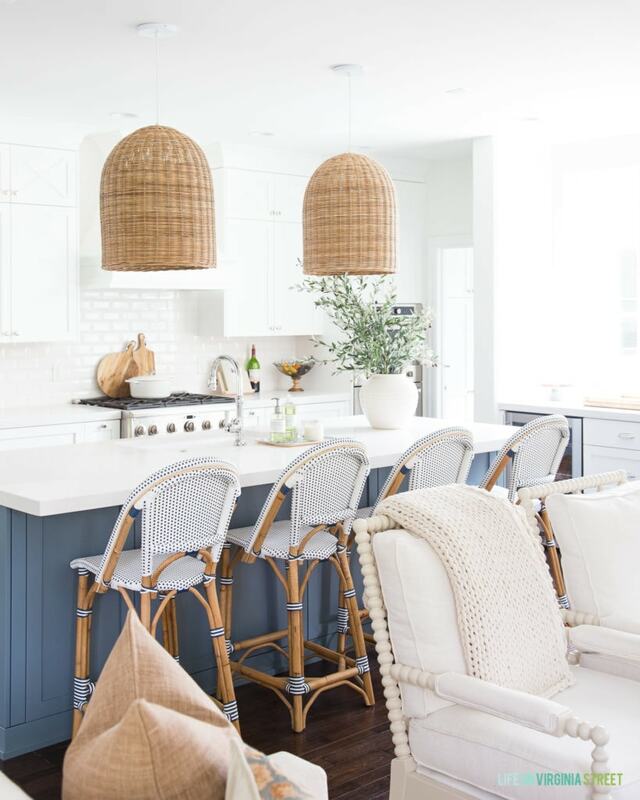 I was worried our rattan pendant lights might not transition to other seasons, but I actually love the warmth they add to the kitchen for fall! 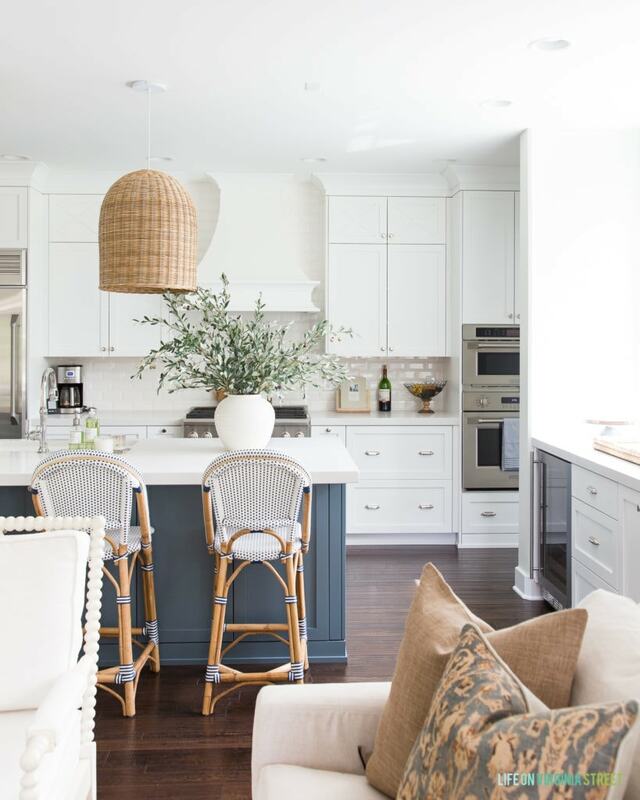 Even our counter stools look ready for fall with a few new accessories in the kitchen. I had to buy another one of these white vases because I want one in every room – I’m that obsessed with it! It looks perfect filled with faux olive stems for fall! We recently updated our fireplace and I love our freshly painted living room so much more because of it! The warm fall tones keep everything from looking too stark in here. These frames are filled with black and white photos I took on various trips to Italy. I shared even more ideas in my post on simple and affordable artwork ideas. I love that I can change out the “art” seasonally with very little cost. I’m already scheming up ideas for the holidays! 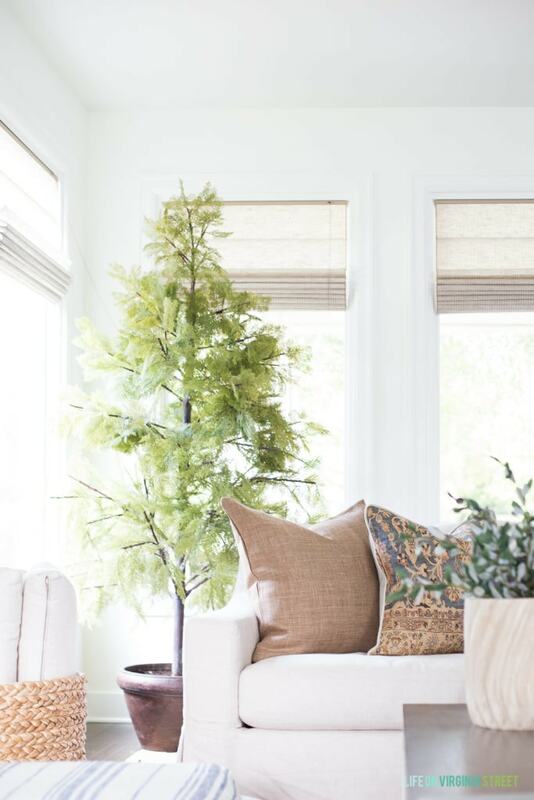 This faux cypress tree is another recent addition to the space and it’s one of my favorite faux plants ever! Moving into our dining room, I recently made some changes for fall as well. The artwork is actually a piece I found at HomeGoods, but then added additional paint in order to get the colors I was looking for. It’s still a work in progress but I feel like it’s getting close. I’m hoping to share a tutorial for how I painted it soon! I bought our hutch a few years ago at Nebraska Furniture Mart and unfortunately it’s no longer available. However, I have a post with more details as well as some similar options! 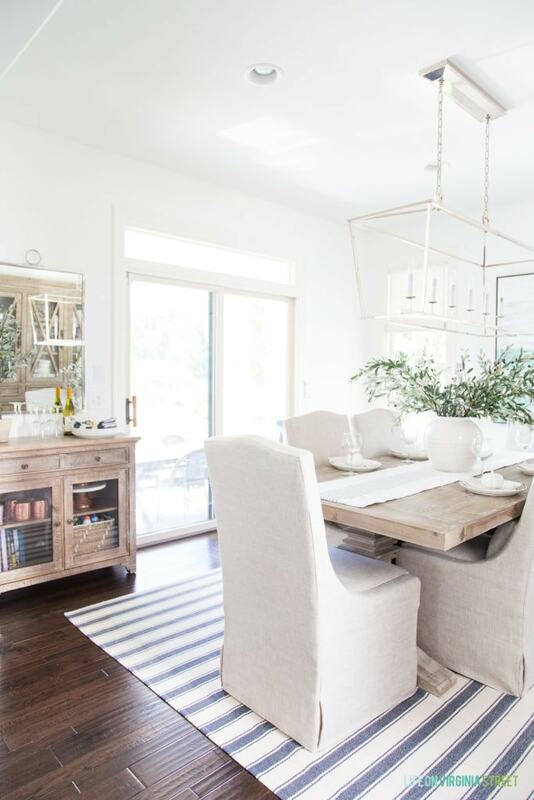 This new cabinet and mirror have been the perfect addition to our dining room. 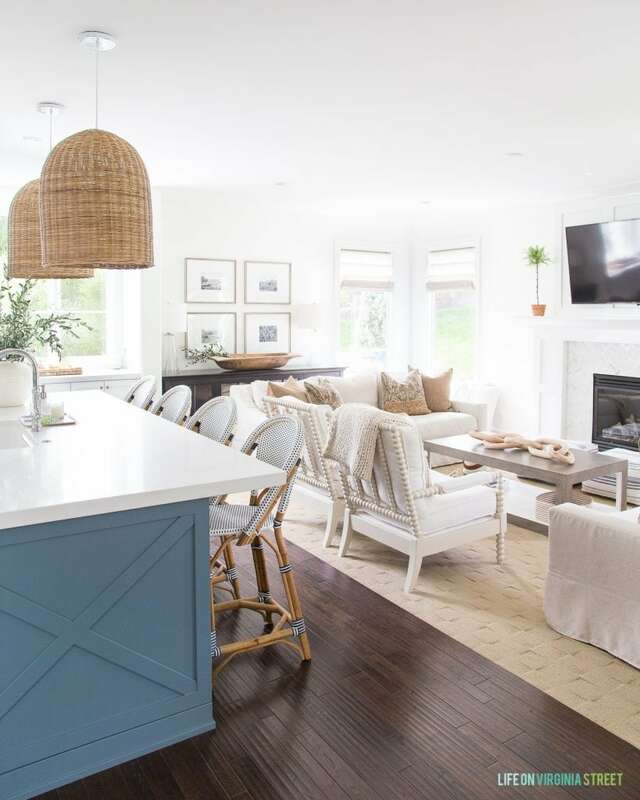 Not only do they completely change the functionality of the space, but they look so much prettier than the bar cart we used to have here! You can read more about these recent additions here. 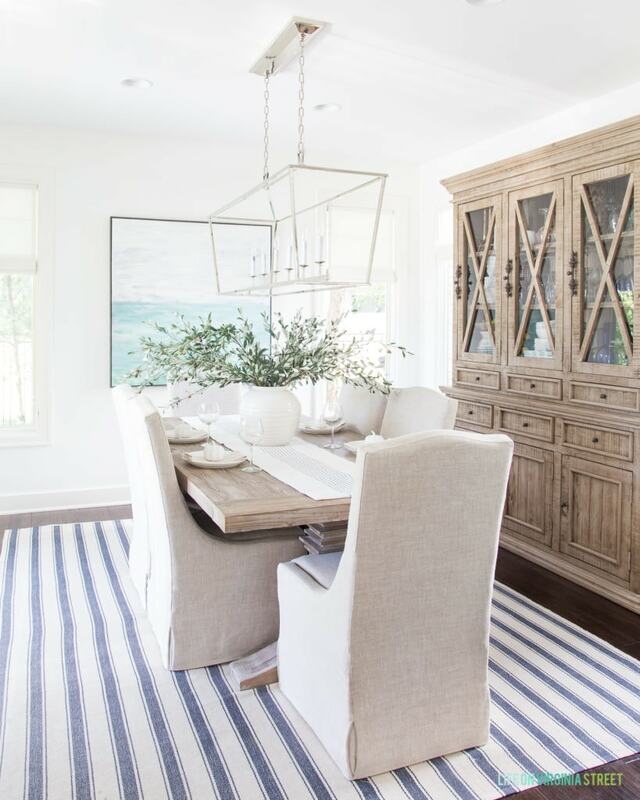 This view from our dining room into our kitchen is one of my new favorites! 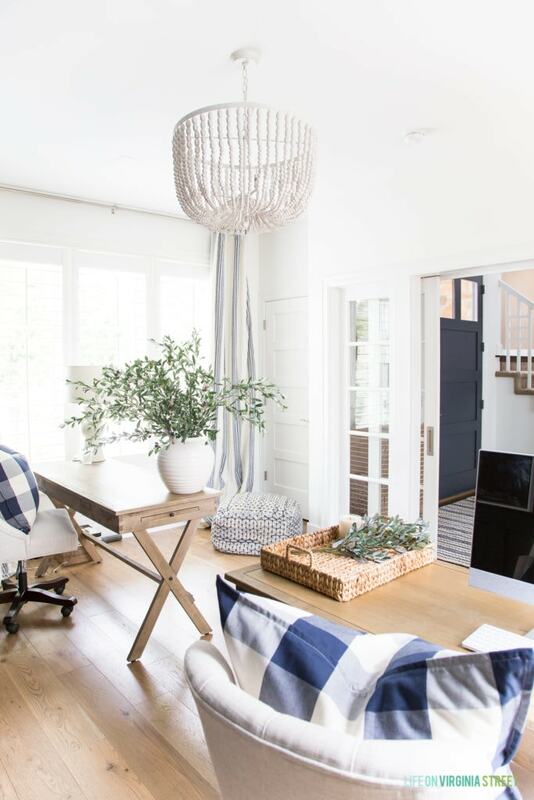 Now that all of the spaces in this area are painted Benjamin Moore Simply White, it all seems to flow so much better from room to room! Moving into our home office, which is actually just off our entryway, I again kept things fairly simply. 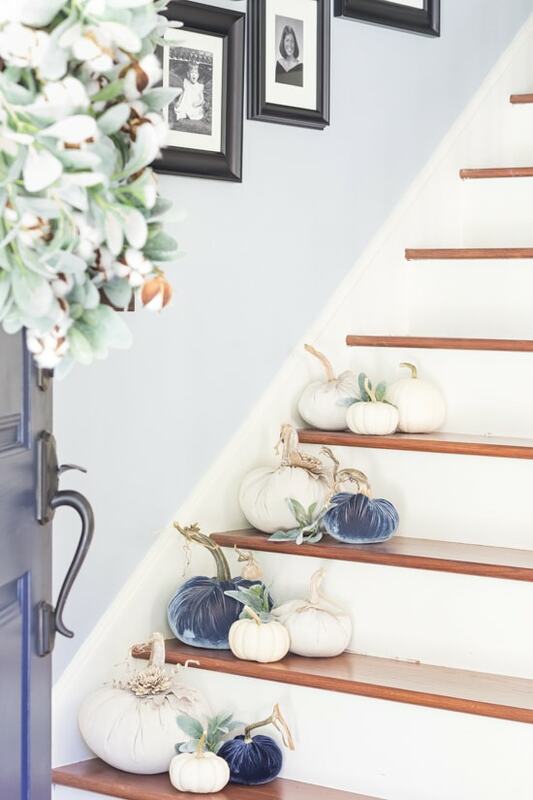 This blue pumpkins canvas from Lindsay Letters is the star of the show. It’s been fun moving it to a new space after having it in our living room last year! But I think my view is the best! Not only that, I have view of the courtyard to my right which always seems to make me even happier! Moving upstairs, I made some simple updates in our smaller guest bedroom as well. 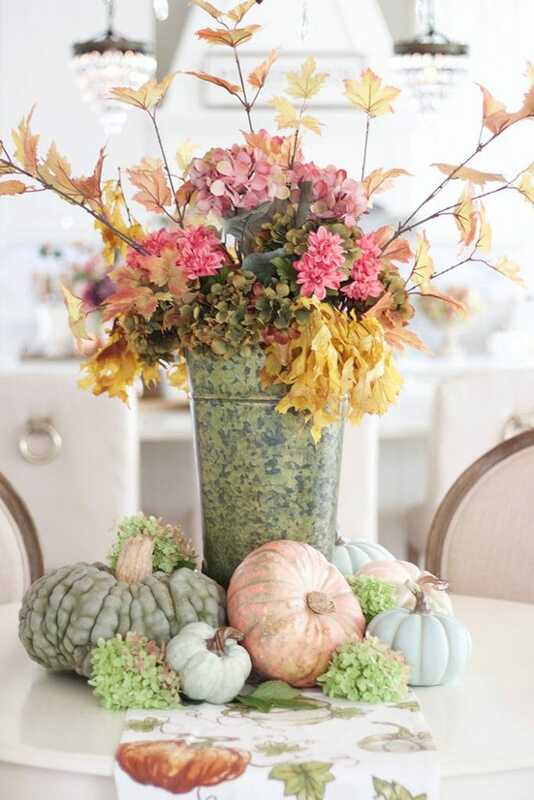 I stuck with my usual blues, greens and neutrals but added in some additional layers and fall touches. I found the linen and velvet pillow at HomeGoods but found a nearly identical one here. 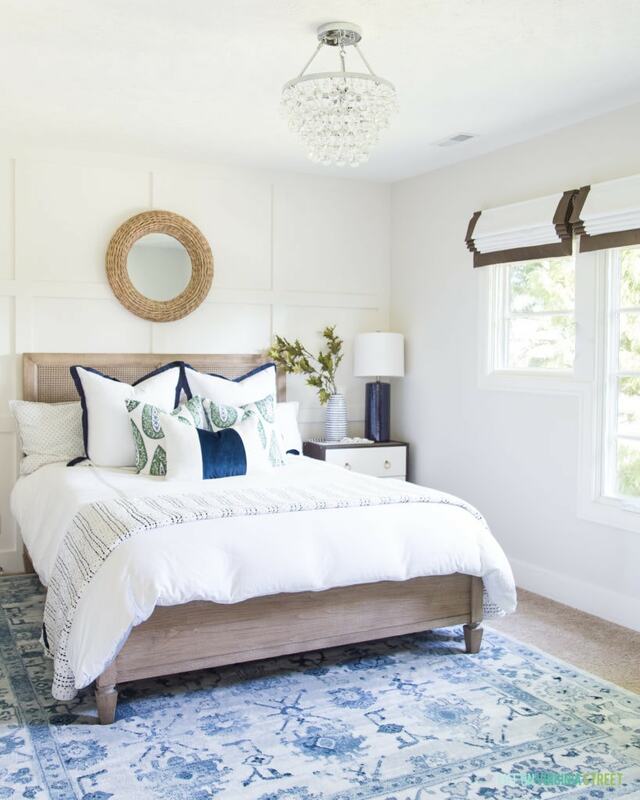 Our main guest bedroom is the only room where I haven’t incorporated any blue for fall! But, I love this earthy combination of neutrals, browns and greens. I’m on a mission to slowly bring browns and warm tones back in style! I just can’t do grays anymore! 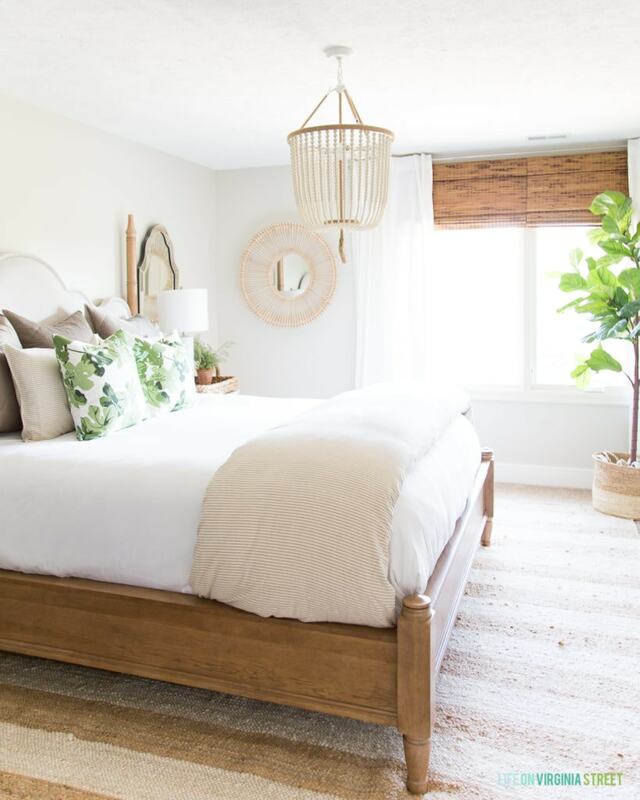 I moved our faux fiddle leaf fig tree up here and love the extra green in the space! 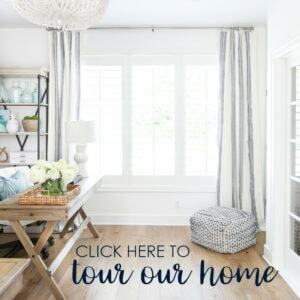 I hope you enjoyed our full fall home tour! The next stop on the tour is Styled with Lace. Then, following are all the other stops on the Autumn’s in the Air tour! 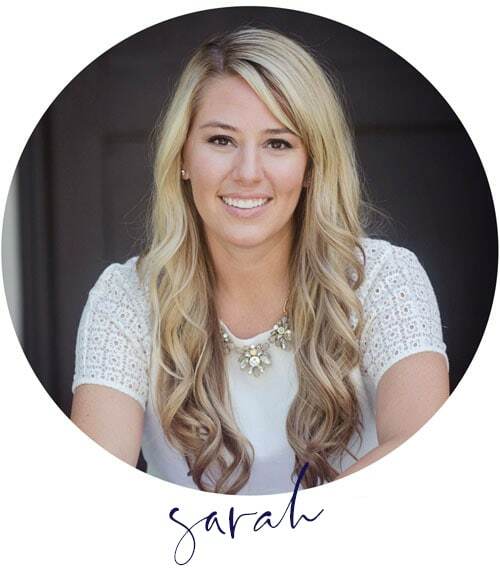 Just gorgeous, Sarah! I particularly love the living room!! 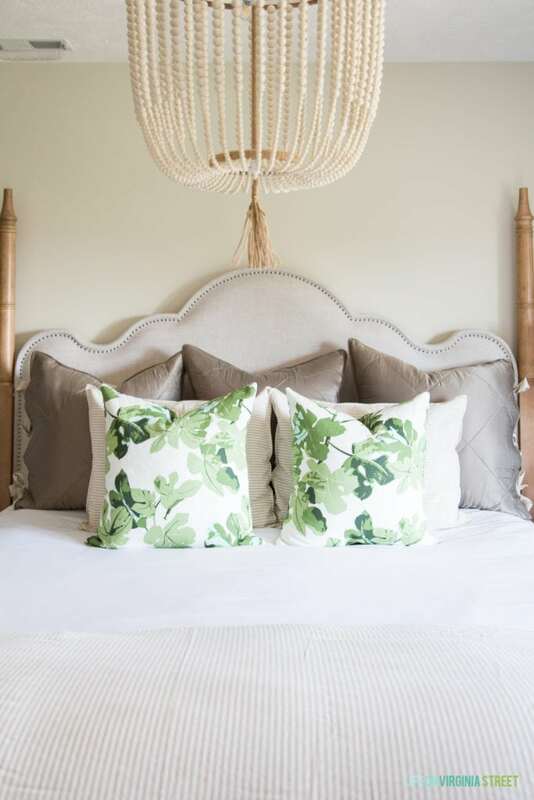 The pillows, the dough bowl and everything else has that light linen-y feel I love so much! Stunning! 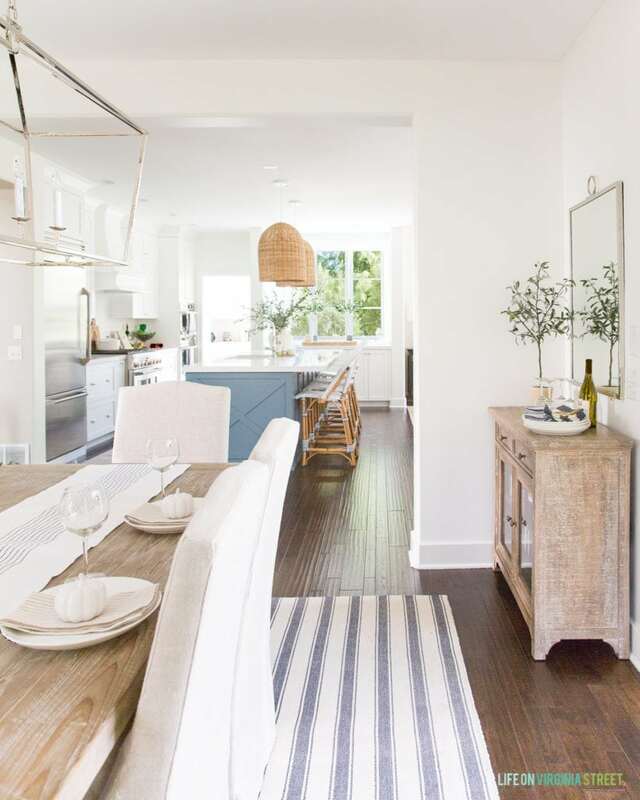 Your home is so gorgeous Sarah, and the new kitchen has made it even more stunning! I love your subtle touches of fall with all the neutrals, but I think my favorite thing might be your printed fall colored pillows on your sofa. They are so perfect!! Thanks so much for joining us Sarah and happy fall to you! Sarah, what a lovely Fall tour! 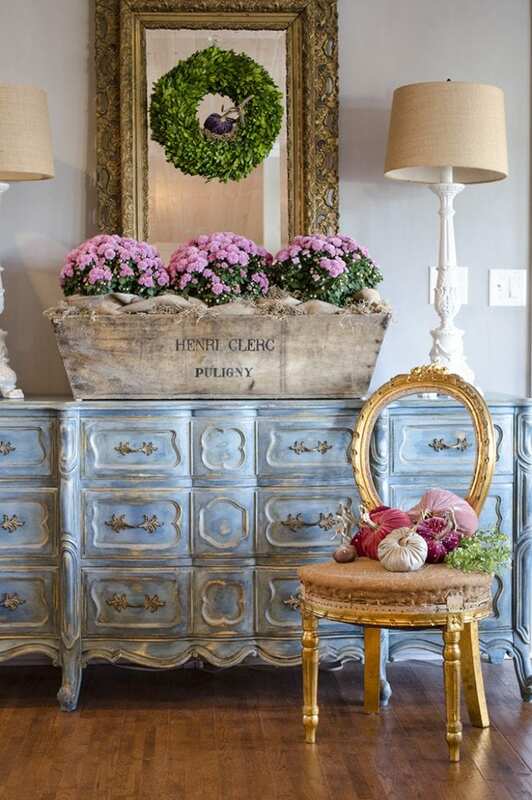 Loving how you’ve used subtle, natural fall touches. 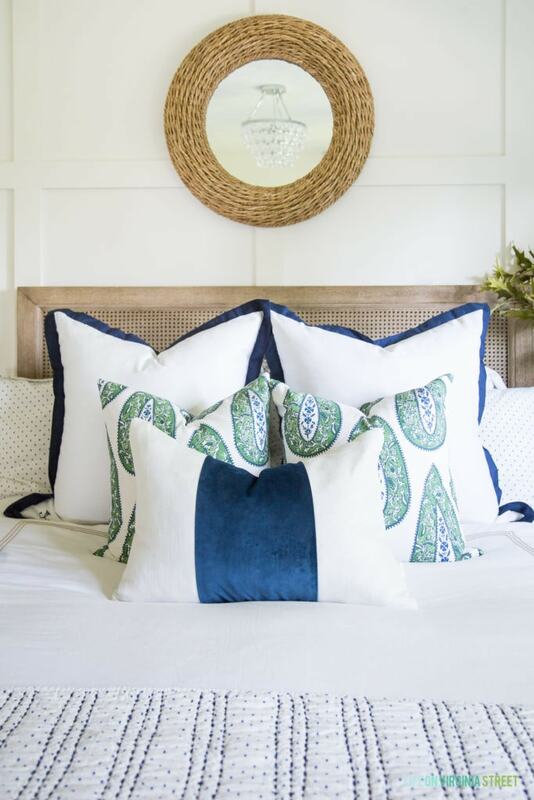 The PB pillows are gorgeous ! Are all the fig leaves pictures from Amazon! I love them! Some are from Pottery Barn and some are from Amazon! Beautiful home!! 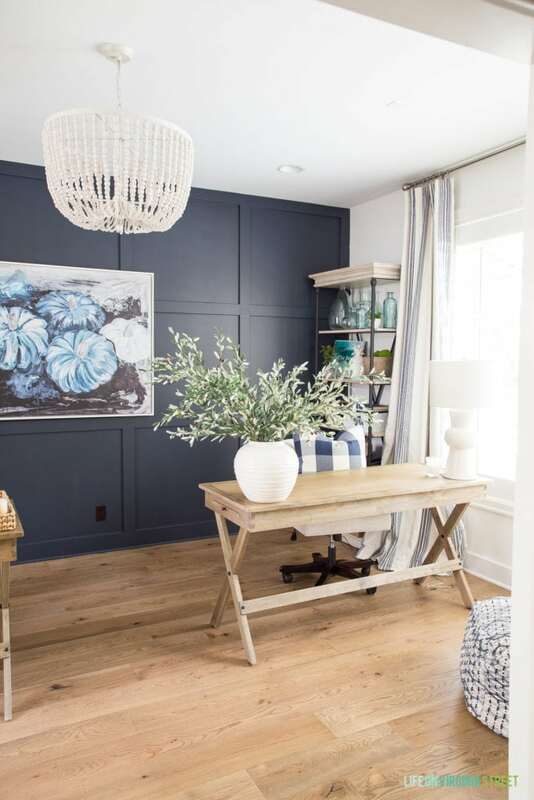 What color is the dark blue wall in your office? Thank you! 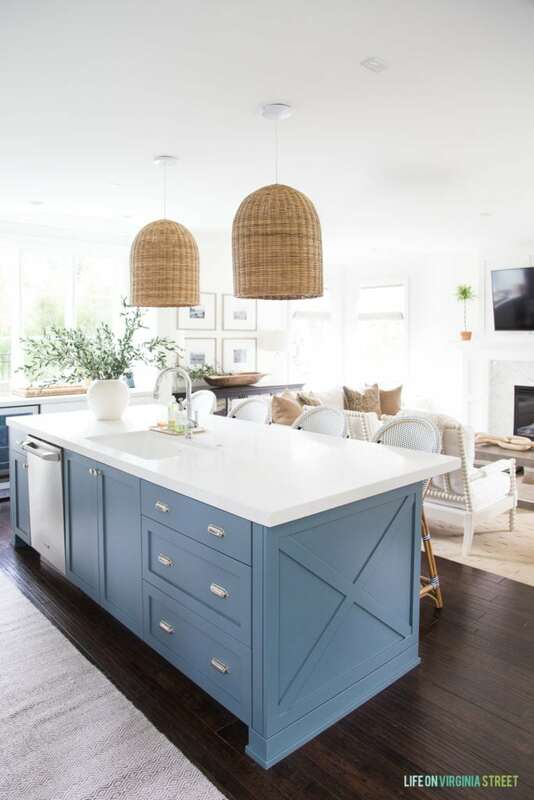 It’s Benjamin Moore Hale Navy.